M855A1 5.56mm NATO Penetrator Ammo Feed Ramp Issues: Real, Hype or just Overblown? | DefenseReview.com (DR): An online tactical technology and military defense technology magazine with particular focus on the latest and greatest tactical firearms news (tactical gun news), tactical gear news and tactical shooting news. M855A1 5.56mm NATO Penetrator Ammo Feed Ramp Issues: Real, Hype or just Overblown? M855A1 ammunition has been in use overseas since at least 2011, and has been in widespread service at most U.S. Army bases since 2014. I myself first saw it in 2012 in Afghanistan. Now, when M855A1 first came out, like many others, I heard the stories that due to the increased pressure the round produces (around 62,000 PSI) compared to M855 (around 53,000 PSI), M855A1 was causing M4/M4A1 carbines to wear out faster. Specifically, an increase in bolts breaking, gas ports eroding in barrels, and most notably damage to feed ramps was occuring. Seeing how a proof round (tests maximum load the M4/M4A1 can handle) comes in at 70,000 PSI, it just makes sense given the dramatic increase in pressure the round produces, carbines are going to go down more often and sooner. But is this true? After all, during my time when M855A1 was in use with my unit from 2012 to when I retired in October 2016, I witnessed no real increase in broken guns. What about damaged feed ramps or receivers? Not a single one. “Ok, but how much M855A1 did you actually shoot?” Great question. I can tell you that over a period of two years I’d estimate I shot at least 3,000 rounds of it through two different uppers, a MK18 and a M4A1, both suppressed and un-suppressed, all while using the same lower receiver. During that time, those same uppers also saw at least a thousand rounds of MK262 and a few thousand rounds of M855 green tip. Now, I know I’m just one man, and that does not make for good data. Just because I personally saw no issues doesn’t mean they don’t exist. But what I find very interesting is that on the 12-man A team I was on, many were shooting the same if not more M855A1 than me with their carbines. We didn’t have any carbines go down, or any parts failing. Nor did I see any damaged feed ramps. This despite the fact that many members, myself included, at times ran the Improved magazine with tan follower that the military specifically blames for feed ramp issues with M855A1. We did however have two out of twelve carbines that had severe bore erosion to point that they were deemed “shot out”, and needed new barrels–but they still functioned. Do I believe M855A1 can be having a negative effect on the M4 carbine, across the board in the military? Sure. There’s quite possibly an increase in broken bolts, gas port hole erosion, worn gas tubes and such. But where I think it’s over blown is in the reports of feed ramp damage. Despite what the Army’s said, I think that, based on some things I’ll go over, while M855A1 may indeed have contributed to some feed ramp damage, it’s not the main culprit behind it. And, it’s also my opinion that due to circular reporting, the number of instances of feed ramp damage has been inflated. Now before I get into it, let me say this: I actually do not like M855A1. Reason: I prefer accuracy over everything else. That’s why during five out of six of my combat tours, I ran MK262 77gr ammo, which even out of a 14.5 military barrel, holds about 1 MOA. When M855A1 was first issued at our home base (FT Bragg NC) back in 2013 (prior to this M855A1 was only available in combat zones), we heard instances of feed ramp damage from M855A1 coming out of the 82nd Airborne. Now, in Special Forces, I bet we shoot annually close to triple the amount of 5.56 per man compared to what a paratrooper in the 82nd shoots. So upon hearing they were having damaged feed ramps from M855A1, one would think you would see even more of it happening in our unit, given the higher round counts we put through our carbines. But really, no. The fact is, during the time I used the ammo, up until I retired (about 3 years), I never saw or heard of any SF guy getting damaged feed ramps from M855A1. In fact, speaking with many 18B Weapon Sergeants, whose job it is to maintain each team’s weapons, even now in 2018, not one has seen damaged feed ramps from M855A1. Understand that I’ve indeed tried to research and find data on broken guns due to M855A1. Funny thing is, the only published data I can find is a couple of pics from the 82nd Airborne. 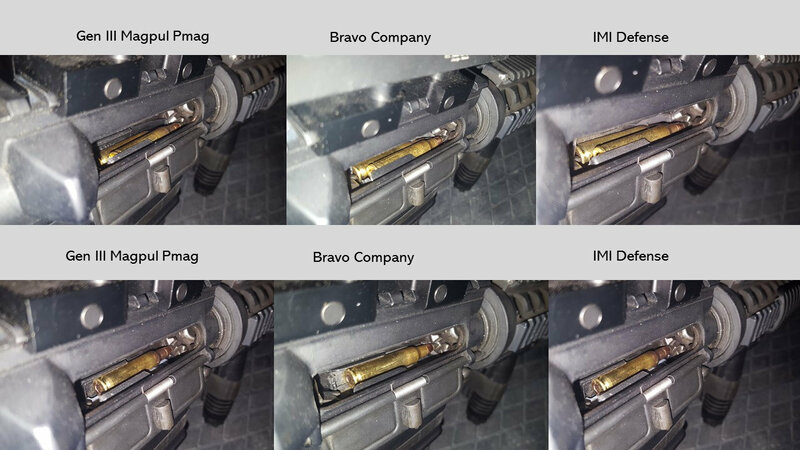 In fact, those same couple of pictures seem to be used as the primary evidence that M855A1 damages feed ramps in numerous articles against using the round. So, early on in M855A1’s stateside implementation, we hear one unit having problems with M855A1. Now, years later, the only evidence of issues comes from that same unit, rather than from several military bases. Just one unit. This, along with the same pictures being posted over and over again of “evidence” of issues, make me strongly think the cause for damage may not be from just the ammunition, but rather another factor that exists in that unit. Now, I realize that the Army has come out and said there is evidence, hence the creation of the Enhanced Performance Magazine, specifically designed so that the nose of the rounds sits high against the feed ramps, allowing minimal contact with the ramp as the bullet goes into the chamber. But again, could it have something to do with a certain issue within the unit? If there’s one thing the U.S Army’s very guilty of doing, it’s issuing soldiers sub-standard magazines. Having spent 7 years in the regular Army in the infantry, one thing that was considered standard practice was to issue each soldier a certain amount of magazines. By that, I mean making the soldier sign a hand receipt for them, making them accountable property, as opposed to the disposable item they’re intended to be. And, to make matters worse, if soldiers do realize they have a poorly functioning magazine, and turn it in for new ones, many times, the bad magazine does not get destroyed or thrown away. Instead, they’re thrown right back into the unit’s surplus pile of mags, only to be re-issued later to another soldier! Just how bad is this problem? Here is a perfect example: In 2014 in Afghanistan, in our supply room, I came across a military issue magazine with black follower. Why is that bad? Well, seeing how the black follower magazine was replaced in the mid-1990’s by the green follower magazine, it meant this magazine was at least 20 years old! And, even though the Army had published a memorandum suspending use of the black follower mag, there was still a chance some soldier could be given it to use in a combat zone. This begs the question: If I was able to find one in a Special Forces unit, what are the chances of finding more with regular Army units? Pretty good, I bet. With this in mind, I think it’s plausible that the reason for damage to feed ramps only happening within a certain unit could be caused by faulty magazines to begin with. We’re talking about damaged or worn magazines that were not feeding right to begin with, and allowing the rounds to impact below the feed ramps and hit the receiver. If you look at the existing photos, you can see where the sharp nose of the M855A1 was impacting below the feed ramps. These impacts are well below where just about any normal magazine feeds rounds onto the ramp. 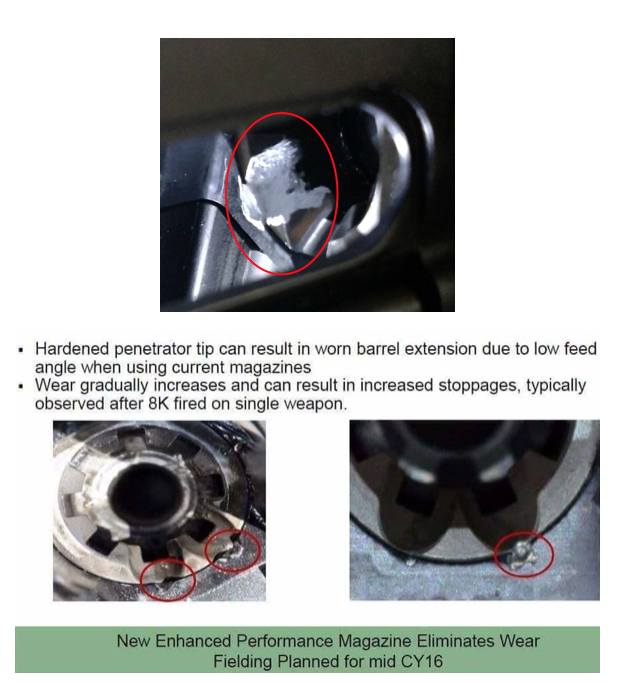 So, it’s because of this that I think perhaps it was a feeding issue from a poor functioning magazine that resulted in the rounds hitting low (below normal of any mag), causing the damage–not to totally say M855A1 did not have any negative effect. The nose of M855A1 is the sharpest of any 5.56 round I have ever seen. I can totally believe it being capable of damaging the aluminum receiver. However, I do not believe there would be any damage had properly working magazines been used. I’m not just talking about PMAGs or the new Enhanced Performance Magazine (EPM), just any properly functioning magazine. You can clearly see where the nose of the rounds were hitting the receiver. But really, with any ammo, this would be deemed to be feeding too low off the magazine. While those really low strike marks were made from the nose of M855A1 rounds hitting it, that’s the result of something, and not the cause. 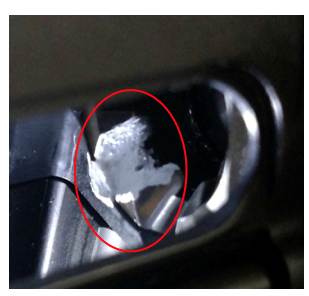 For the actual cause, I can only speculate that perhaps it was damaged feed lips allowing rounds to slip off the magazine prematurely during the loading process, like when one gets a double-feed with an extra round slipping up, except here, perhaps rounds are slipping off too early. But what about the super-hard material of the round tearing up the feed ramps? There is after all one photo of broken feed ramps. Well, first off, those damaged teeth on the feed ramps look more like the result of a broken bolt breaking off parts of the feed ramps. If the hard steel nose of the M855A1 were damaging the ramps, wouldn’t one expect to see little ravines being dug into the ramp from the hard tips of the rounds dragging over and over again in the same spot? 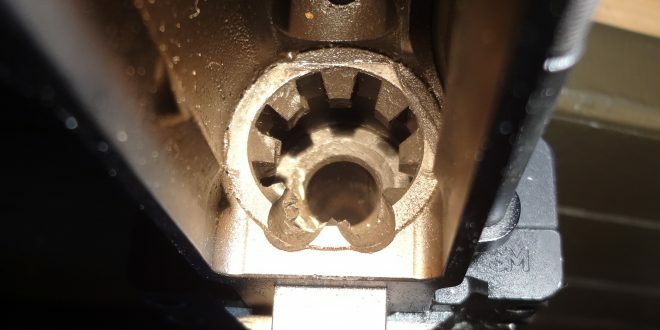 The damage to this feed ramp looks more like it was caused from super-hard unlocking or extraction, breaking pieces off, rather than rounds running over it at a poor angle and chipping away at it. The damage to the feed ramps here was caused via bolt with broken lugs still cycling in the weapon while I was shooting MK262 suppressed in a MK18 upper. The jagged edges of the broken bolt lugs locking and unlocking caused parts of the feed ramp to get chewed up. This seems similar to the military photo claimed to be from M855A1 feeding over it. So how do I prove all this? Well, really, we have to look at where the M855A1 round sits in serviceable magazines. Specifically, where does the tip of M855A1 make contact on the feed ramp as it loads into the chamber from both the left and right side,as it comes off the magazine. Now, some magazines are clearly better than others in terms of how high the round sits. Of course, the higher the round sits, the better it is for loading. But that’s true with any ammo, not just with M855A1. 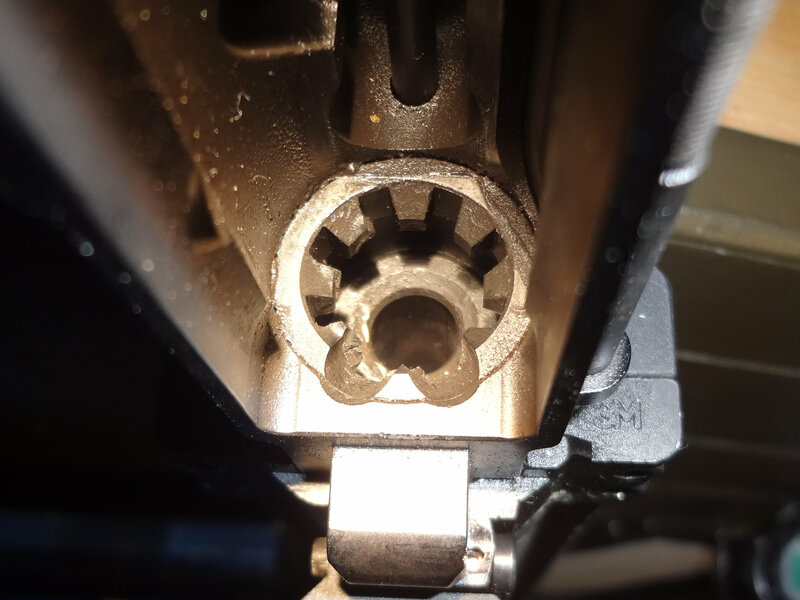 While it’s not known to have damaged feed ramps, because MK262 has a flat nose, it’s prone to catch on any gap or lip between the receiver and the feed ramp, causing it to get hung up, leading to chambering issues. I experienced this myself twice in my career, once with a MK12 MOD 0, and again later with a standard M4 and MK262 ammunition. 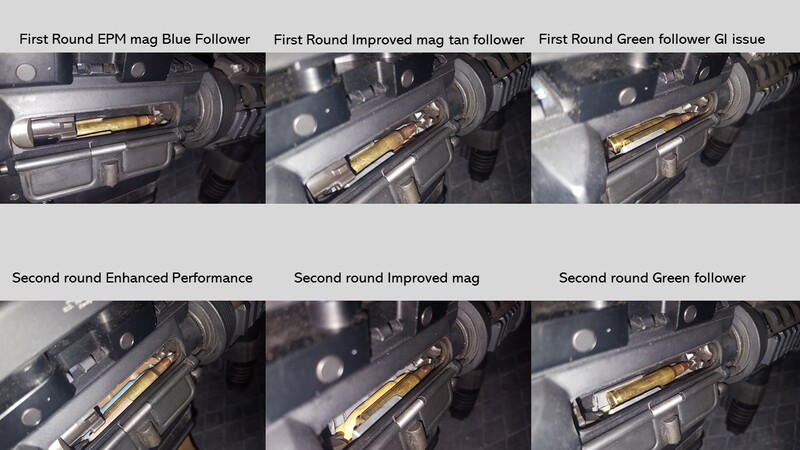 So, the only way to try and show that M855A1 is not the root cause of the damage, and is instead just the result of the rounds hitting too low, I had to test as many magazines as I could, and show where they all allowed the round to make contact with the feed ramps. For this test, I used a Colt upper with M4 feed ramps and a SOCOM heavy 14.5 barrel, just like what is used in the military. To measure just where the round makes impact on the feed ramps, I did not use any sort of micrometer to measure. Instead, I just loaded up each mag with two rounds, and pushed the rounds forward by hand until the tip of the bullet made contact with the feed ramps. The results? Take a look at the following pictures ((in no certain order) and decide for yourself which magazines fed the rounds the highest into the chamber. 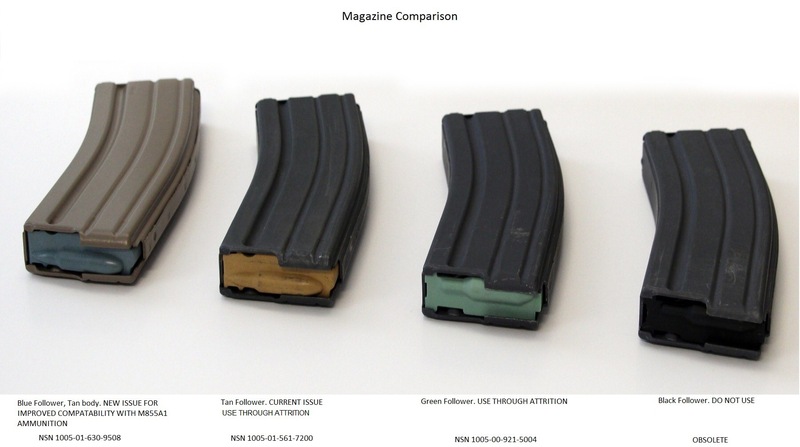 Out of all the magazines I checked, the best for having the highest clearance, both left and right feed, was the military issue Enhanced Performance Magazine (fully clearing the feed ramp on the left side, two thirds of the way up on the right), followed by the Gen III PMAG and Israeli Military Industries Defense magazine. There was no real difference between the GEN III PMAG and the IMI Defense mag. Both seemed to load the rounds just as high as the other. Next, loading rounds to what appeared to be at least halfway up the feed ramps was a three-way tie between the GEN II Lancer L5 AWM, the Military Improved Magazine, and the GEN II PMAG. It should be noted that during the time I was active duty and shooting M855A1 with my team, the two most prevalent magazines used in the unit were GEN II PMAGs and the Improved mag, as they were both issued by the unit. The last group sat the lowest against the feed ramps. They were the Army mag with green follower, the BCM aluminum mag, the C Products Defense mag, and USGI mag with black follower. So, if one is concerned about feed ramp issues and M855A1, I would stay away from these magazines, since the tips of the rounds had the most contact with their feed ramps. Finally, the worst magazine, which appeared to load the right-side round very close to bottom edge of the feed ramp closest to the receiver, was an old HK steel magazine issued to SOF in the mid 2000s. I would not use this magazine at all with M855A1, as it appears to have the greatest chance of causing damage. I should note that none of the magazines loaded the round below the feed ramps where you see impacts from the military feed ramp pictures. Again, those very low strike marks make me wonder how they were made so low to begin with. I also want to mention that it’s normal for the sides of the nose of the round to make contact with the feed ramp in order to guide it into the chamber during the chambering process. Generally, regardless of the ammo, the bullet tip itself should not be making contact with the feed ramp. 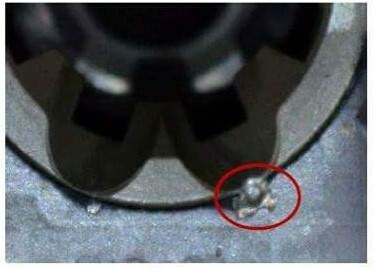 Out of all the magazines tested, only three appear have allowed the actual tip of the round to make contact with feed ramp. 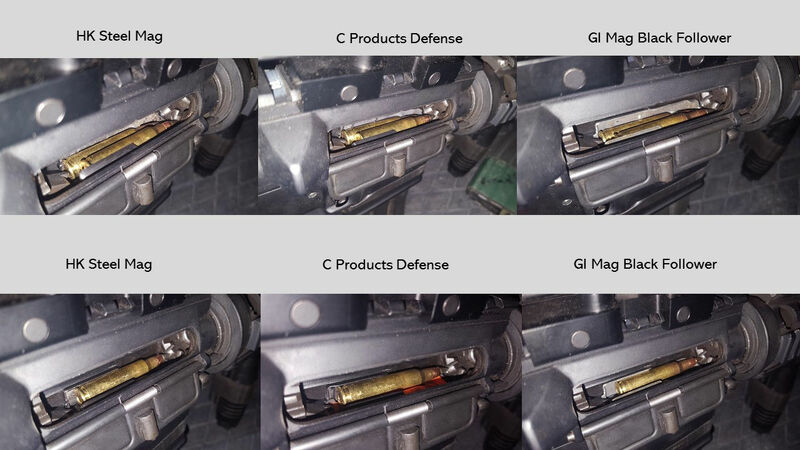 With the USGI issue Improved mag with tan follower, USGI mag with green follower, and the HK steel mag, the contact point was at the very top end of the feed ramp, and no where near the bottom as pictured in the photos of damaged feed ramps provided by the military. With the availability of M855A1 to civilians being very limited, the chance of the average civilian shooter getting ahold of enough M855A1 to perhaps cause some damage is a non-issue right now, in my opinion. The one positive from this I can see being useful for everyone is that magazines that load higher up the feed ramp can be more reliable. Less contact = smoother chambering. Less contact between the nose of the round and the feed ramp means there’s less chance of rounds getting hung up with loading issues when the weapon is dirty and dry from excessive firing. 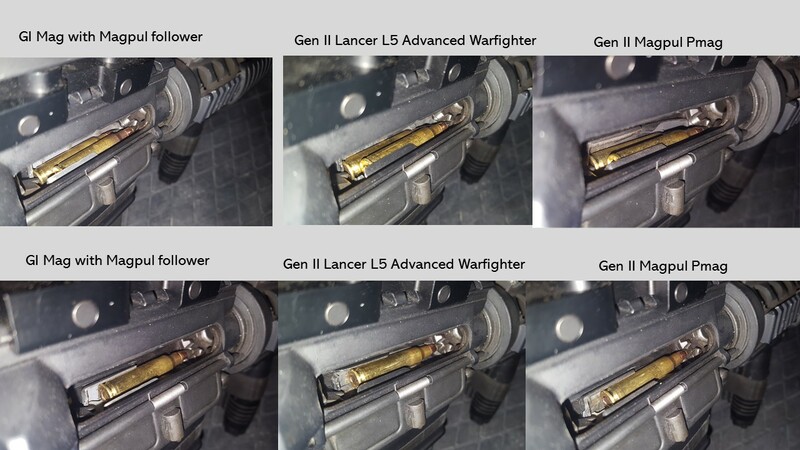 If I couldn’t get ahold of new military issue EPM or Gen III PMAGs, I’d use Lancers, Gen II PMAGs and the Improved Army mag, which is what I did use with M855A1. Perhaps that’s why, when I was on active duty, we didn’t see any real issues with M855A1 and feed ramp damage, because we predominately used those magazines that did a pretty good job at loading the rounds high. If that’s true, I think that lends credence to my theory that units having feed ramp issues were using very sub-standard magazines. It’s also possible that it was a rifle issue like bolt bounce on full-auto causing a round not to chamber correctly. I understand that my personal, anecdotal experience and the lack of issues from my unit of a few hundred soldiers is nothing compared to the hundreds of thousands of soldiers that have used M855A1, from whom the military may have collected data. Given the hardness and sharp tip of the round, M855A1 certainly does have the capability to damage rifles more. But, with any weapon using incorrect functioning mags, there’s a greater chance for damage to that weapon. I think to say M855A1 is the cause may not be true. It has just highlighted an overall problem that must be solved: bad magazines in service with the troops. © Copyright 2018 DefenseReview.com and Jeff Gurwitch. All rights reserved. This material may not be published, broadcast, rewritten or redistributed without receiving permission and providing proper credit and appropriate links. MagPod PMAG AR-15 Magazine Base Pad(s)/Floorplate: Sometimes it’s the little things that count! Jeff Gurwitch: IMI Defense Tactical AR Rifle/Carbine/SBR Accessories (G2 Enhanced 5.56mm and 7.62mm NATO Rifle Magazines, Flip-Up Buis, Buttstocks and Angled Foregrips) are Good to Go!